The Fraternal Order of Police needs at least 100 participants to join its 5K Race/1-Mile Fun Walk. The purpose of the run is to help the widows of our fallen officers with funding to go to the National Peace Officers' Memorial Service held in Washington DC this May. It's a service that honors police officers killed in the line of duty. 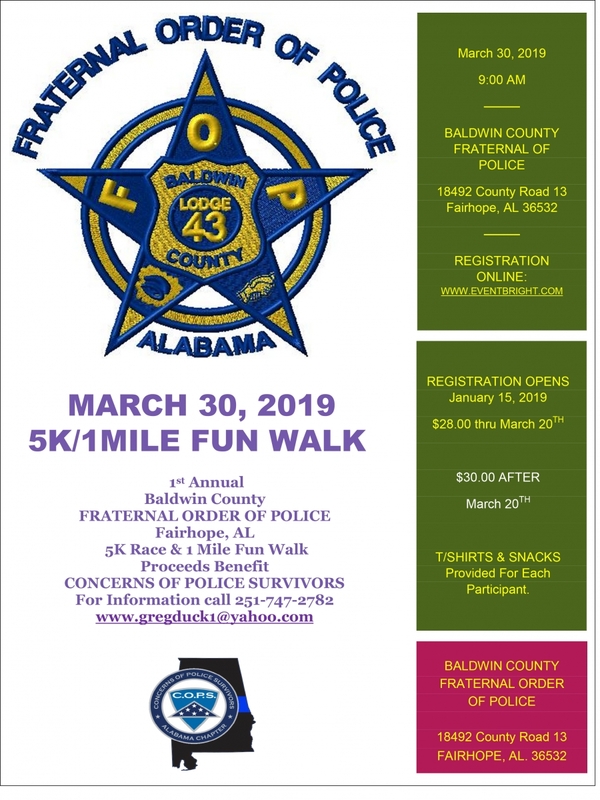 The 5K Race/1-Mile Fun Walk is Saturday, March 30, 2019 at 9 a.m. at the Fraternal Order of Police Lodge, 18492 County Road 13 in Fairhope. Registration is available online at www.eventbright.com. For more information on how to participate, see attached flyer.